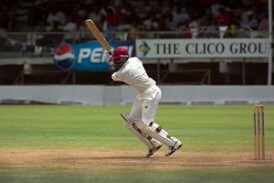 Brian Lara on his way to another quality batting performance. I’ve often thought it would be great to have a way to assess the impact of cricketers; a method of assessing how a batsman’s (or bowler’s) performance impacted the outcome of a particular match, beyond the simple accumulation of runs or wickets. In I posited a system of determining such impact, by assessing the state of the match at the instant the batsman came in as compared to the state when he was either dismissed or his innings otherwise came to an end. The batsman’s individual impact is then based on his share of the runs accumulated while he was at the crease. As an example, in Brian Lara’s eighth match (Test number 1220), he came in at number four in the third innings with West Indies 147 runs ahead with eight wickets to give; the win probability at that stage for West Indies was 0.633. When Lara was out having scored 96, the West Indies’ win probability was then 0.781, an increase of 0.148. Lara scored around 57% of the runs added (I’m rounding all figures up here) which gives him an impact share of +0.084, or +8.4%. So we can do this for each innings and sum each individual impact share to give a career aggregate. Now, everyone knows that Don Bradman was the greatest batsman who ever played Test cricket (unless you think it was Sachin Tendulkar). I have in the past wondered how much of Bradman’s greatness came from playing in great teams – for example, the 1948 Invincibles are widely considered to be one of the greatest Test sides ever, if not the greatest – was he, as Isaac Newton modestly claimed, standing on the shoulders of giants? Brian Lara, on the other hand, I consider to have been a great among lesser men, ploughing a lone furrow as West Indies only world-class batsman – I recall a sports journalist once refer to a Brazilian soccer player turning out for a certain northern English team as “an orchid in a field of turnips”, which may be an appropriate description of Lara’s abilities when measured against those of his team mates. Certainly a significant part of Lara’s career came after West Indies period of greatness and during their inexorable slide to Test minnowhood. Bradman was typically quite well supported while crafting his high scores – he was in good company in 14 of his 29 century innings, having colleagues accompany him past the mark almost 50% of the time. By comparison, during the almost eight-year period from August 1995 to April 2003, Lara was the sole century-maker in all of the innings in which he reached at least a ton, Lara reaching that pinnacle on thirteen occasions in 108 innings (ironically a period longer than Bradman’s whole career). In total, Lara was supported by a fellow centurian in only 9 of the 34 innings in which he reached that milestone, a little over 26%, or around half the time Bradman had such help. Significantly, in the previous study it turned out the highest impact innings ever played was indeed by Lara, his 153* against Australia in the third Test of 1998-99 which turned almost certain defeat into spectacular victory. It’s remarkable to contemplate that the 153*, as well as his other pivotal innings of 213 in the previous match, occured during the period mentioned above. The above numbers support my feeling that Lara, in spite of Bradman’s amazing record of high scores, may have had pound for pound more impact than the great man, or possibly any other batsman for that matter. In the earlier feature only fourth innings performances were considered; that was because I was performing the assessments manually. Having improved my database skills somewhat since that time I am very close to completing a full assessment of every Test batsman’s career impact on a per innings and aggregate basis, but in the meantime I couldn’t resist looking at the careers of the two batsmen I personally rate most highly, Sir Donald George Bradman and Brian Charles Lara. There are a number of ways in which we can analyse the numbers resulting from the assessment described above: total career impact, average career impact per game, maximum positive game impact, maximum negative game impact, number of games above a certain impact level, plus all of the above in percentage terms in order to offset the disadvantage to those whose careers were shortened for whatever reason. Due to the reasons I mentioned earlier, i.e. Bradman’s higher quality contemporaries as against Lara’s less successful colleagues, I anticipated that Lara’s impact would exceed that of Bradman, at least in terms of career aggregate, as Lara would be seen to dominate on enough occasions, coupled with the fact that this would be factored over almost three times as many innings. Bradman on the other hand I felt would be coming in on more occasions with the outcome already in his team’s favour. Before we get into the numbers, there’s one other thing to explain – if the win probability increases while our player failed, or decreased while our player succeeded, these impacts are not included in the career impact figures – in either case the player does not deserve to be credited or debited. Well there you have it in a nutshell; despite batting in barely a third as many innings as Lara, Bradman actually exceeds Lara’s total career aggregate for impact – I couldn’t have been more wrong. You could interpret these figures as Bradman, in all of his Test innings, had the equivalent impact of turning more than four matches from zero chance of winning to victory, while Lara, in almost three times as many innings, performed a similar feat in just over three matches. Keep in mind that I haven’t included in the above figures any negative team impacts where the player was himself successful. Incredibly, Bradman had a positive impact on his team’s win probability in more than half of his innings. Lara also performed admirably in this regard with almost a third of his innings being positively impactful. It’s certainly the case that Lara was denied the opportunity to maximise the impact of a significant portion of his successful innings by the failure of his team mates (WPD-/IND+), though Bradman suffered in that regard to a larger degree than I anticipated, with ten of his 80 innings negated in that way. Nonetheless, the larger percentage of innings where Lara succeeded while his team failed as compared to Bradman, begs the question – were any of Lara’s innings rendered less impactful than innings of equivalent size by Bradman due to a difference in quality of support? The above is eye-opening; if Bradman scored a hundred or more the team’s win probability was positively impacted on all but one occasion; conversely, on no fewer than six occasions Lara scored a century only to see his team’s win probability decrease by the end of his innings! Notably in those seven matches above Lara scored 62% of the runs accumulated while he was at the crease. It is possible to calculate the change in win probability had Lara’s team mates shared the work load on a more equitable basis in those games, and when we do that we find that he does indeed receive an uptick in positive impact, insofar as three of those negative impact matches become positive. As a percentage of total innings this puts Lara on a more equal footing with Bradman, so there is certainly evidence that Lara was let down by his team mates. As might be expected based on what we’ve seen to this point, Bradman’s innings enjoyed a higher level of impact, with the notable exception of Lara’s 153*. Though that may not seem significant, it seems Lara was typically under more pressure to succeed when he came in to bat than Bradman was. Of the 80 times Bradman came in to bat, Australia’s win probability was less than 50/50 on 39 occasions, i.e. about half the time. Lara, on the other hand, came in to bat with the opposition team favoured on no fewer than 150 occasions, a significantly higher proportion than Bradman. The support which Lara received tailed off dramatically after an encouraging start – in his first 22 innings Lara came to bat with his team in a winning position 14 times, or 64% of the time. After that, he enjoyed a winning position at the beginning of 67 of 209 innings, which is only 32% of the time. While Bradman’s teams were not always successful, he enjoyed a more balanced degree of success in terms of win probability when he came in to bat throughout his career, 45% in the first half and 58% in the second half. Though the numbers were not exactly what I expected, there’s little doubt that Brian Lara was required to carry his team on his broad shoulders to a larger degree than was Don Bradman. It’s difficult to say how much more impactful Lara could have been had he played in a better Windies team – I will say however that had he played in the great Windies teams of the 1980s, Brian Lara could possibly have given Don Bradman a run for his money as the greatest of all time. Next time I’ll post the final career impact assessments for all batsmen.